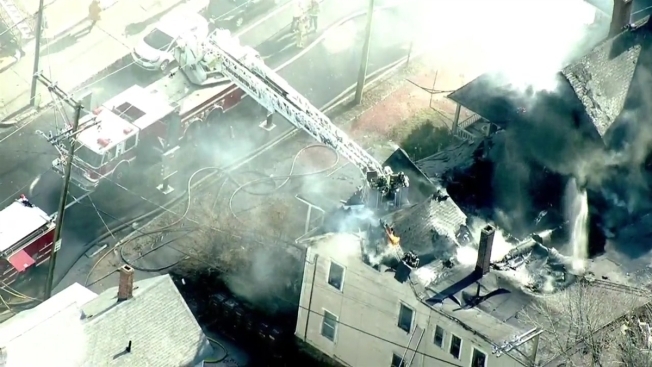 Aerial video from the Sky Ranger helicopter showed flames and heavy smoke still coming from the roof of the Hanover Street building shortly before noon. A firefighter was injured battling a blaze in Manchester, New Hampshire, on Thursday morning. The fire was first reported at 9:55 a.m. at 324 Hanover St., and when firefighters arrived they encountered fire conditions on all three floors of the building. They attempted to gain access to search for occupants, but that was difficult due to the heavy fire conditions. Interior firefighting operations were deemed unsafe, and all fire department personnel were ordered out of the building to fight the fire from the exterior using ladder trucks. Photos showed thick black smoke coming from the building that could be seen from miles away. Aerial video from the Sky Ranger helicopter showed flames and heavy smoke still coming from the roof of the building around noon. More than 100 firefighters from numerous area departments helped battle the blaze. Firefighters were able to re-enter the building later in the day and determine that all residents made it out safely. Manchester Fire Chief Daniel Goonan said one firefighter was injured, suffering a burn to his arm or hand. The fire is believed to be accidental, and it appears to have originated in the kitchen area of a first floor apartment. The investigation is ongoing.